Agile Tortoise、Markdownをサポートしたアウトラインツール「Drafts for Mac」のBeta版をProサブスクリプション向けに公開。 | AAPL Ch. 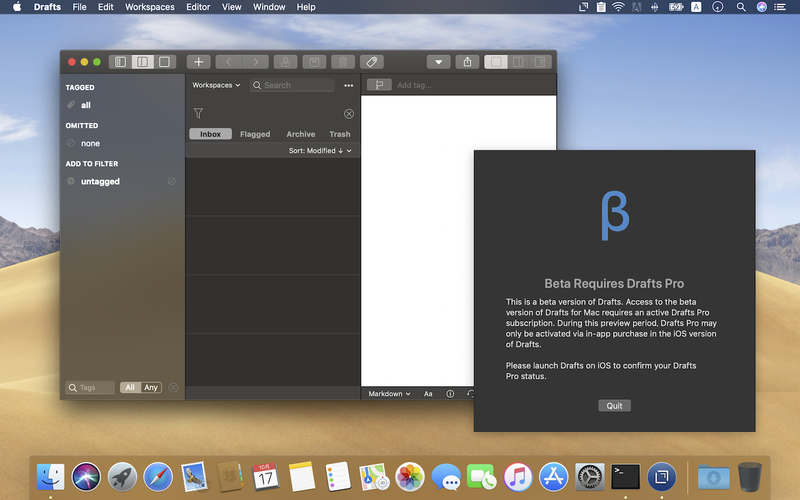 This page will contain information about beta access to Drafts for Mac. Please read details below for answers to common questions about the beta. Check back here regularly for new builds. Does Drafts for Mac use Marzipan or whatever Apple calls it? No. Apple announced tools to run iOS apps on Mac coming next year. When those are available we will evaluate whether it makes sense to also incorporate them into the Drafts story, but we want a proper, native Mac experience for Drafts and will be delivering a proper, native Mac app to accomplish that goal.